This recipe was really popular in the 50s/early 60s. It was one of the first scratch cakes I made (so easy a child can do it!). For today's audiences, it has the benefit of being not only easy, but vegan as well - no eggs, milk or butter. Recipe is from American Cake by Anne Byrn, as well as the cookbook pictured here. She calls it ‘Wacky Cake’, which is what I’ve seen before. 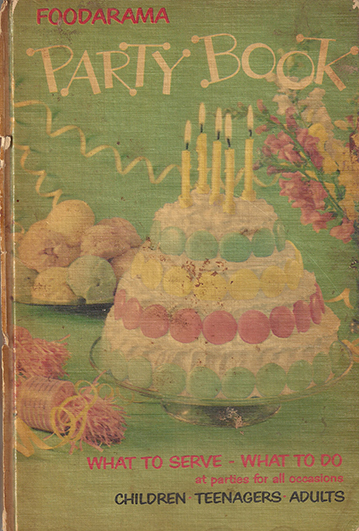 The 50s era party cookbook pictured has the same recipe, but they call it ‘Crazy Cake’. Benji is my grandson, and we call it ‘volcano cake’ because it has baking soda and vinegar like the science experiment volcano, and fizzes when you add the vinegar. When we made it, he was very disappointed that it didn't blow up. 13x9 non-stick pan – no bowl needed, just measuring cups/spoons and the pan. Cheap ones are fine, even a disposable one should be OK.
Measure dry ingredients into pan, stir to combine well. Make three depressions/holes in the dry ingredients. One gets the oil, one the vinegar, and one the vanilla. Stir to mix somewhat. Pour 1 cup water over everything, stir to mix, pour second cup of water, mix well until all well combined and batter is smooth. Bake at 350 for about 30 min. It should rise, but still look damp. It’s done when a cake tester or knife comes out clean, and the top springs back when lightly touched. It won’t really look 'done', since the top may still look damp. Cool (it may sink a little when it cools), and ice with any frosting you like, or just sprinkle/dust with powdered sugar. It's great warmed for a few seconds in the microwave and served with ice cream or whipped cream.